The most critical relationship at office is employee- boss relationship. To learn and grow one must build strong and trusting relationship with their boss or manager. Although managers have been friendly with employees, one must be cautious not to jeopardize the relationship by saying wrong things or by being too casual. Few employees are always confused on how to develop a good relation with their boss, so they resort to speak very less and avoid communication. Such communication gap cannot result in long and nurturing relation. One should ask questions to know the management style, values and interests of the boss to succeed at work. Keep reading to know the list of questions which will certainly help you at your workplace. It is a good practice to greet your boss every day; this initiative has to be necessarily done from employee. You can judge the mood of your boss as soon as you are in office by asking this question. Also he may assign you any task which is on priority that day. 2. Any important task for me? Though you are aware of what tasks to be done, make sure you ask your boss regularly whether he has any tasks for you. Everybody loves initiative and a person with zeal to take up new tasks. There may be a chance that your boss may not assign you important tasks but looking at your imitative and willingness, he may give you few at some point of time. Obviously that will turn out to be a good learning opportunity. Weekend is a time for all to catch up on personal things like hobbies, family time. 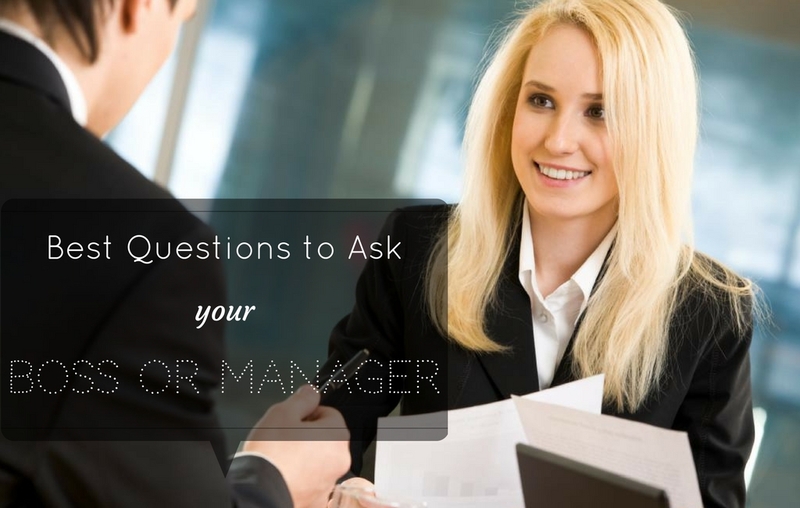 Asking this question will help you to know your boss personally. You may also ask questions like, ‘How’s your son’s health now?’ Or ‘how was the cricket match on weekend?’ Such questions will make your boss realize that you listen to him carefully. You also have chance to let your boss know about your hobbies and activities. A person who is able to balance personal and professional life well is surely a person who deserves to move up the career ladder. 4. Will you join me for Lunch? Bosses at time avoid to socialize outside work as they fear of being tagged for favoritism, yet you can ask and see how they receive it. If he does come to you for lunch, try to stick to non-work and neutral topics. 5. Anything new at organization these days? It’s no secret that, bosses and managers know the inside story of what’s going on in organization. The motive of this question is not to gossip but to be genuinely interested to know how organization is growing or what challenges is it facing and the ways implied for overcoming them. This question can make your boss realize that you are actively engaged with the company and not just there to do work and collect the pay cheque. Employee should not wait till review meetings to know what their feedback is. Your boss can have many things at hand, He may not have time to appreciate you or correct you at all times. Hence it is necessary that you yourself ask probing questions which will help you know your feedback. Few of them are as follows. 1. Why did you hire me? This question can sound odd if you ask it abruptly. One should ask this question casually and make sure your boss knows that you are asking it just out of curiosity. While you were hired, your boss may have interviewed several candidates, you were hired most probably because you fit the job well and had some striking quality which appealed your boss the most. If you get a specific answer for this question, you can know your best quality and work upon it further to sharpen it. 2. How am I doing? Any specific feedback for me? This is indeed a direct and probing question; you will surely get feedback from your boss, which will help you to align your further actions. Do not hesitate to ask this question, because your boss may not himself tell you feedback from time to time. Knowing your feedback earlier than your review will give you chance to improve yourself and also saves you from the surprises you may face in your review. 3. What’s one thing I can do differently? The approach of work and style depends from person to person, some managers give freedom to work their own way, but some expect to follow their way. So get things done in your way as you may need some persuasion. This question can give you que for your areas of improvement. 4. How were the employees who worked before me? This question will help you know likes and dislikes of your boss. You can ask this question when you receive some rough feedback. This will lighten the tone, and give you specific feedback or a clear picture of your manager’s expectation. Also you get to know whether your boss appreciates with open heart or talks bad about people. 5. What do your peers think about me? No department at office works independently, every department is interconnected and codependent on each other at some level. So at times other managers may notice you. Knowing their feedback can also help you. Your boss knows you and observes you more closely than others do, so your actions and work may be perceived differently than it does to your boss or maybe perceived differently than you intended. You should not only try to impress your boss but be a good resource for whole organization. 5. What is the growth prospect for me in this role? This question may be suitable to ask during review meetings or at the time of interview. You can know what your boss has planned for you. You can know whether the plan of your boss aligns with your future plans or not, it gives you time to think and also give you a chance to express your aims and aspirations to your boss. 6. Could you let me know if I’ve been asking too many questions to you? Few managers are like a ‘man of few words’, they tend to speak less and expect that employees should figure things out on their own. Make sure you recognize this soon by directly asking this question and be cautious to ask few questions or ask them at the right time. Your manager has experience and faced several challenges, asking him about his difficulties, aims and aspirations will let you get to know him better. Moreover if you offer to help him in reaching his aim, you can certainly get some brownie points. 2. Did you ever have a difficult boss? How did you handle it? 3. How did you learn to embrace failure? With years of experience, person becomes mature and learns how to embrace failure and learn from them. Your boss can tell you some stories regarding this and will tell you how he got out from it. This can make you learn more than you can from some management school lessons. 4. Can you teach me something about good leadership? By this question you are communicating that you like the leadership skill of your boss and express your interest to learn from him. Good leadership skills are necessary to learn if one needs to succeed. It’s good to talk about it to as many people as possible and develop yourself in this skill. 5. How do you recover from setbacks? Can you tell me about any recent incident? Managers deal with several critical situations, they deal them well with their expertise, wit and communication. Experience can teach you several things and this question will let you know about difficult situation one can face. 6. How did you develop such good public speaking skill? Can you give me some tips to improve mine? This question can make your boss happy as pubic speaking is the skill one develops after lots of practice, someone admiring and wanting to learn from them is indeed a reward in itself. Make sure you are listening intently to the answers, as you are not only aiming to improve the relation but can also learn a lot from your boss. At workplace you will face many difficulties and your boss is the best person who can guide you. Also you should recognize your weakness and overcome it by taking help from your boss. The best way to learn from him is to not ask a direct question like ‘How can I be a better communicator?’ as this question is very vague and your boss may not have time to address the question in detail. Instead one should break the question into situations and ask him. 1. I was in a meeting today and I wanted to convey my idea on advertisement but I was hesitating a bit and could not speak confidently as I became very nervous. I feel my idea was good, but I need to speak more aggressively. Can you tell me how I can do so? Questions like this helps your boss understand you better. He realizes that you know your weak areas and are willing to work on it. Other than recognizing it, you are also willing to admit it and ask for help, this indeed is a quality of a good future leader. Your boss will reassure you are doing well, if it has been only your inhibition, or he will give you genuine tips to improve. 2. I am excited to work on ABC project from tomorrow, I have never handled such big clients, Can you provide me some tips and also feedback during my course in the project. By asking such question you are expressing your enthusiasm, asking for tips and also communicating that you want to be corrected whenever you go wrong. By being open and by telling you need help; you can certainly get some help from your seniors. 3. I have difficulty dealing with getting things done from other departments, I think I am not that persuasive, can you tell me how to manage situations like this. Yet again if this is a situation you are finding difficult to handle, your boss will tell you instances or give you tips to improve on this. These are some questions which can help you a lot. When you are open to communicate, take initiative and are willing to take help, your boss will certainly help you for it. Good rapport with your manager will help you to be stress free and productive, which will ultimately result in reaching great heights. So what are you waiting for, now that you know the questions, make sure you gradually begin to break the ice with your boss and develop great relation. I am eager to know whether you have any better questions to add.